Date 25.04.2016 Today is Anzac Day! Anzac Day is celebrated by Australia and New Zealand and is a national remembrance day of those Australian and New Zealand soldiers who served and died in all the wars. 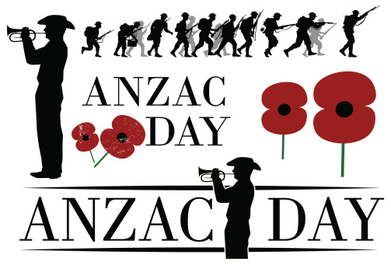 Anzac Day originally honoured the Australian and New Zealand Army Corps (The Anzacs) who fought at Gallipoli during World War I.
Anzac Day was first nationally announced in 1916, marking today the 25th of April 2016, the 100th anniversary. Every year on Anzac Day, each capital state has a dedicated march that is broadcasted live on television. It is a national public holiday in Australia and is considered to be one of the most solemn days of the year. On Anzac Day, the two known rivals of AFL, Collingwood and Essendon, have Australian football matches, which is usually held at the Melbourne Cricket Ground. This annual game is one of the biggest games out of the season, and sometimes it attracts even more people than it would a normal season game. Collingwood is currently ahead with 11 wins, 8 losses and one draw. Each game, the best player with; good skills, courage, self-sacrifice, teamwork and fair play is awarded an Anzac Medal, which is a great honour. Australia Post also issue special postage stamps to commemorate Anzac Day every year with new designs.